Face Shape – which best describes yours? There are so many options in hair today. Choosing what is best for you can be narrowed down by first deciding your face shape. Here are a few ideas for flattering your face shape with Alternative Hair options. These tips will also work for your own hair. The ROUND Shape Face is characterized by a wide hairline and fullness below the cheekbones. Sometimes extra weight can make face appear round and the neck may appear short. These faces look very good with a geometric or linear style. Add height, when possible, and long, wispy side areas to make the cheeks look narrow. Comb hair close to the head on the side and at the nape. The OVAL Shape Face is longer than wide, with a jaw that’s narrower than the cheekbones. Because the oval shaped face has no dominant areas and is so proportional, this face looks good with just about any hairstyle, length or texture. If you were born with an oval face, consider yourself a lucky girl. This is probably the most normal face shape there is, because it has perfect proportions—it’s not too square or too round allowing you a multitude of options for hairstyles. 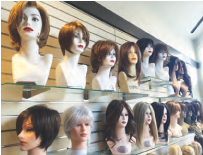 If you can’t decide what shape best describes your face then setting up a private wig/hairpiece consultation will help you determine what styles can work best for you. Contact (203)987 5948 ext 1 or visit www.althairsolutions.com and fill out a consultation questionnaire.